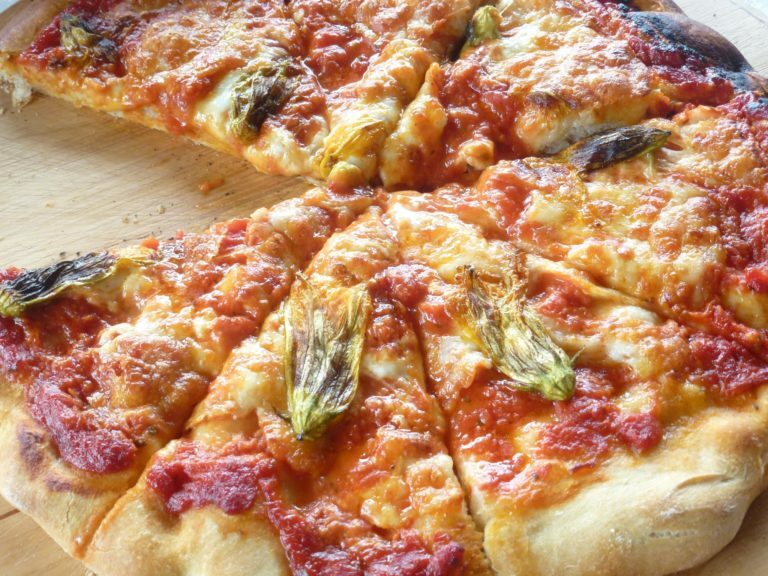 Zucchini flower pizza could be the next best thing! It’s Zucchini season and end of summer. As many zucchini’s, the end of the season can bring a lot of flowers. As a result, many of the flowers are male, and therefor will not reproduce into a fruit. This is the perfect flower for picking. 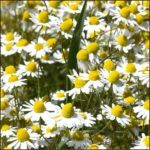 If you’re Italian, you’ll have a great fondness of the male flowers, as they are a widely used staple in the Mediterranean diet. Many Italians fry the flowers, and believe me, there’s nothing finer than a fried up zucchini flower. However, it was hot today, and I wasn’t in the mood to fry in the kitchen. On the other hand, I wanted to somehow incorporate the lovely flower into my meal. Due to the fact that the flower is mildly bitter, their at their best when cooked. Thus the idea of using them as a pizza topper, something I’ve never done before, began to make sense, as well as the question of why I’ve never thought of this until now! 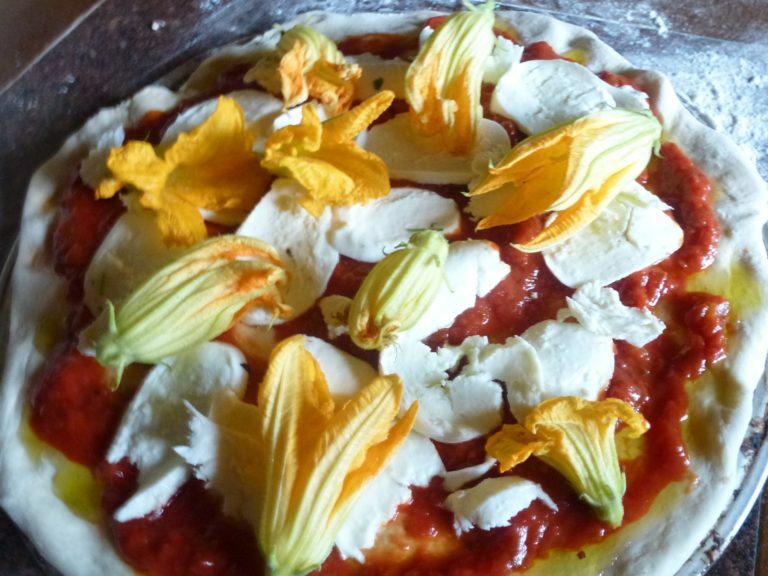 I followed my old Italian friend’s pizza dough recipe, then topped the pizza with my flowers. Amazing results. Unique, rustic, and extremely delicious! 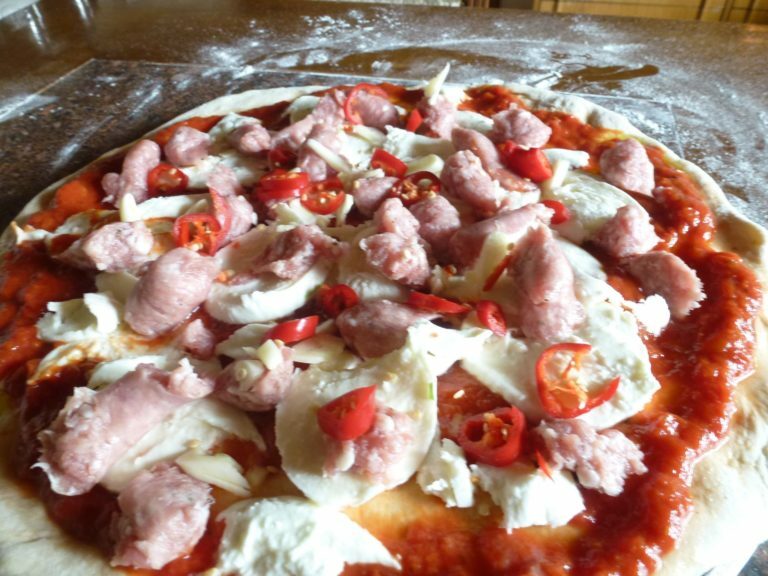 Moral of the story…anything goes, even flowers on your pizza! 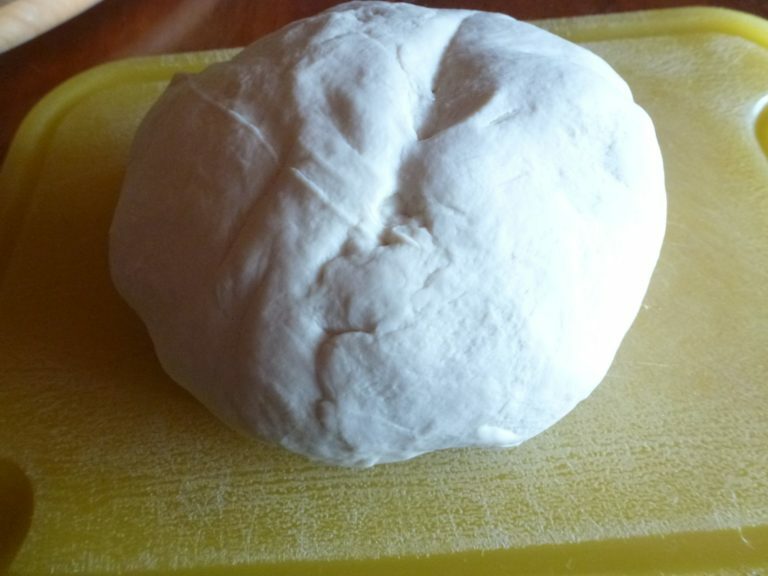 Go about making this typical and simple dough as you would any pizza dough. 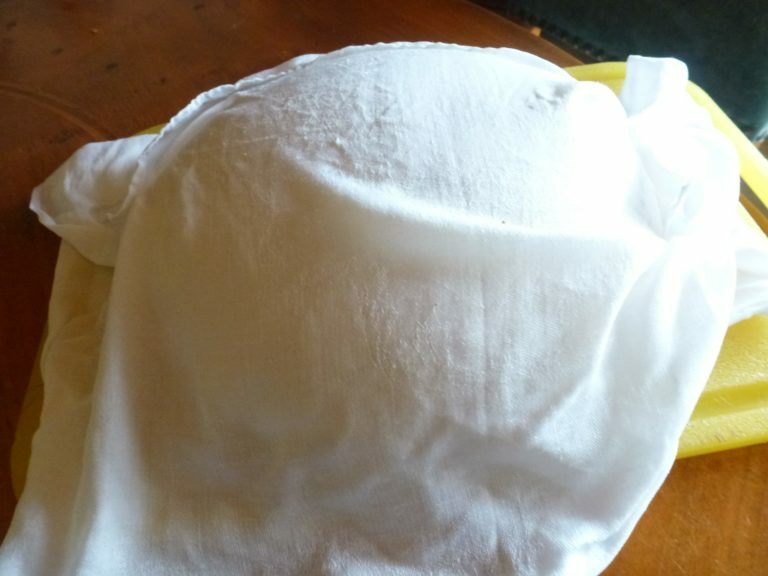 Combine your ingredients with the wet, by adding the warm water slowly until you are happy with the binding, and it’s not sticky. Lay out on a board and cover with a warm water towel, set aside and let it rise. 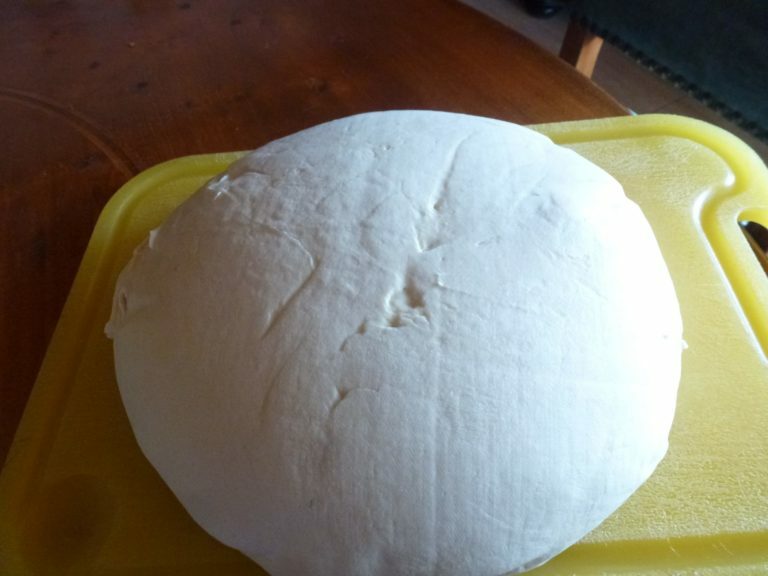 when it’s risen and doubled in size, take the towel off, and cut the dough in half, right down the middle. This will form 2 large pizza’s. spread rounded, flattened dough on a pizza pan, and begin to add your toppers. Begin with olive oil, then your sauce, cheese, and the final topper. Bake in a hot oven (200 Celsius), and use the convection fan, along with the under grill setting. Bake until golden and crust looks ready.